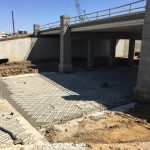 The City of Arlington, TX recently opened a new bridge over Johnson Creek near Cowboys stadium. 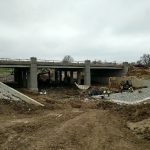 The new bridge was constructed nine feet higher than the old bridge and an old drainage culvert was replaced with a wider open channel to alleviate flooding during heavy storms. 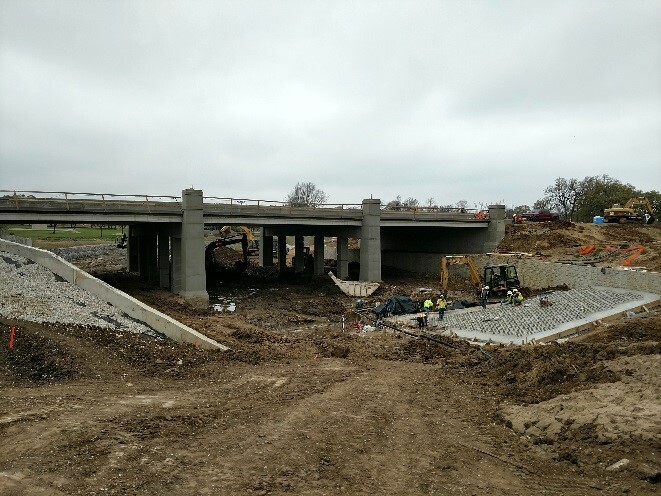 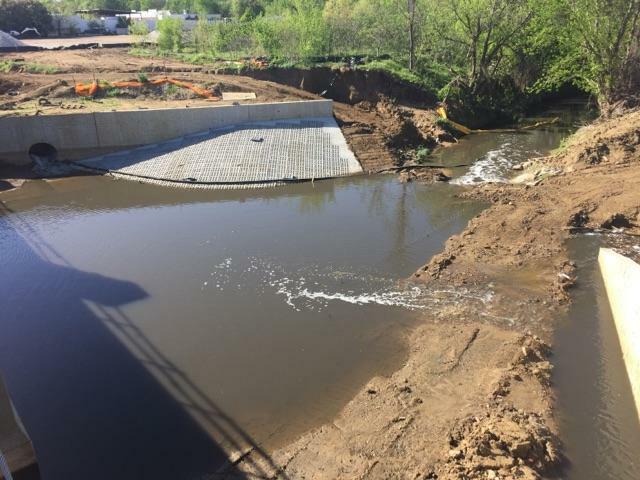 The project civil engineer, Wier & Associates, Inc., specified 31,500 sq ft. of 4” Enviroflex® Articulating Concrete Block Revetment for scour protection around the bridge footprint. 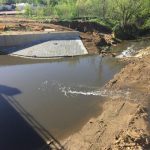 Due to an existing railroad bridge downstream of the new bridge, water backs up in the creek and a 10 year storm results in 24’ of water over the Enviroflex® installation. 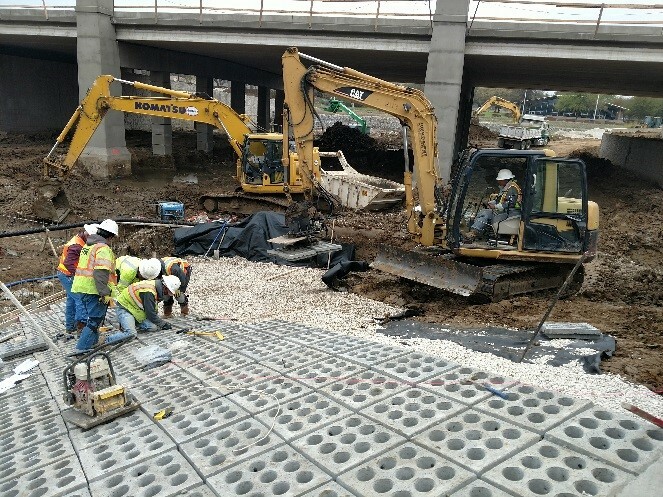 Klutz Construction, Inc., a North Texas general engineering contractor, won the subcontract to perform the Enviroflex® installation and other channel improvements for Tiseo Paving Company who was awarded the prime contract. 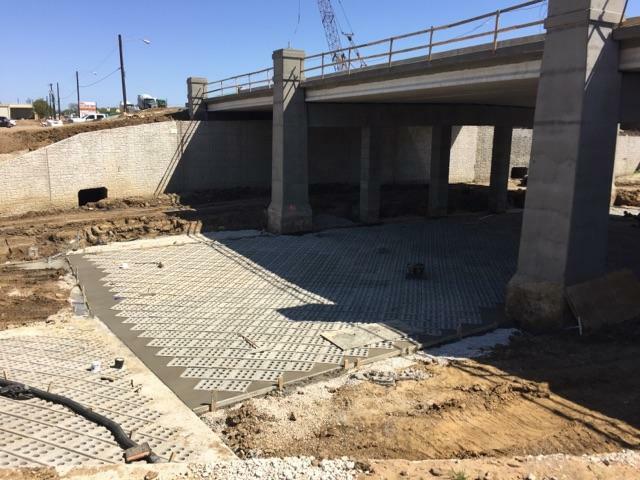 Soil Retention sold the product through its distributor, GeoSolutions, Inc., located in Grand Prairie, TX; very close to the project site. 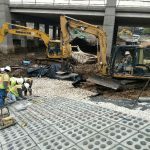 Between February and March 2017, 26 truck loads with 410 pallets of Enviroflex® block, One-Mat® Pins, polyester cables and cable crimps were shipped together with a grappler attachment, which enables the user to place the blocks mechanically with an excavator (see Photo 1).